From the early days of cinema, film producers have used various techniques to create the illusion of depth – with mixed results. But even with digital technology, the latest Hollywood blockbusters still rely on clunky glasses to achieve a convincing 3-D effect. New optics research by a team of South Korean investigators offers the prospect of glasses-free, 3-D display technology for commercial theaters. Their new technique, described in a paper published today in the Optical Society’s (OSA) open-access journal Optics Express, can bring this added dimension while using space more efficiently and at a lower cost than current 3-D projection technology. Polarization is one of the fundamental properties of light; it describes how light waves vibrate in a particular direction—up and down, side-to-side, or anywhere in between. Sunlight, for example, vibrates in many directions. To create modern 3-D effects, movie theaters use linearly or circularly polarized light. In this technique, two projectors display two similar images, which are slightly offset, simultaneously on a single screen. Each projector allows only one state of polarized light to pass through its lens. By donning the familiar polarized glasses, each eye perceives only one of the offset images, creating the depth cues that the brain interprets as three dimensions. The two-projector method, however, is cumbersome, so optical engineers have developed various single projector methods to achieve similar effects. The parallax barrier method, for example, succeeds in creating the illusion of 3-D, but it is cumbersome as well, as it requires a combination of rear projection video and physical barriers or optics between the screen and the viewer. Think of these obstructions as the slats in a venetian blind, which create a 3-D effect by limiting the image each eye sees. The South Korean team has developed a new way to achieve the same glasses-free experience while using a single front projector against a screen. In their system, the Venetian blinds’ “slat” effect is achieved by using polarizers, which stop the passage of light after it reflects off the screen. To block the necessary portion of light, the researchers added a specialized coating to the screen known as a quarter-wave retarding film. This film changes the polarization state of light so it can no longer pass through the polarizers. As the light passes back either through or between the polarizing slates, the offset effect is created, producing the depth cues that give a convincing 3-D effect to the viewer, without the need for glasses. 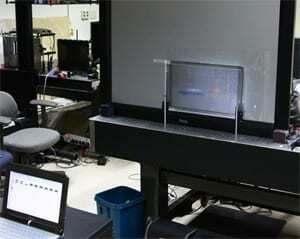 The team’s experimental results reported today show the method can be used successfully in two types of 3-D displays. The first is the parallax barrier method, described above, which uses a device placed in front of a screen enabling each eye to see slightly different, offset images. The other projection method is integral imaging, which uses a two-dimensional array of many small lenses or holes to create 3-D effects. “Our results confirm the feasibility of this approach, and we believe that this proposed method may be useful for developing the next generation of a glasses-free projection-type 3-D display for commercial theaters,” notes Lee.